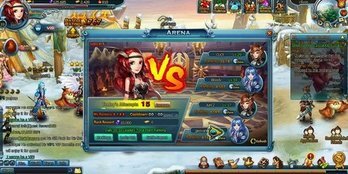 The Arena is a daily event where players can challenge others in pvp up to 15 times per day. If players challenge and defeat a high ranking player, they will trade ranks with them. At the end of the day players will receive rewards which will include amethyst and dragon souls, the higher the rank the higher rewards players will get. There is also a feature called the Lucky Rankings where players can randomly receive vouchers after defeating their opponents at a certain time of the feature. Each day there can be up to 12 Lucky Ranking positions. Players can get between 80-300 Vouchers from this feature.